"Polish Episcopal Letter Day for Consecrated Life"
"The Church is the Feast of the Presentation of the Lord on the day dedicated to consecrated persons. ... There are people in the Church: men and women who, by the oath of the evangelical counsels of obedience, poverty and chastity are particularly consecrated to God." - Read in the letter Polish bishops. Those who through baptism have been raised to the dignity of the royal priesthood, and the confirmation had been deeply conformed to Christ, through the Eucharist participate together with the whole community in the sacrifice of the Lord. The Eucharist is "the source and summit of the Christian life". 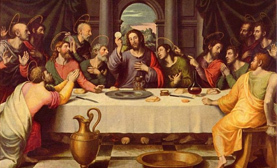 "The other sacraments, and indeed all ecclesiastical ministries and works of the apostolate, are bound up with the Eucharist and are oriented toward it. For in the blessed Eucharist is contained the whole spiritual good of the Church, namely Christ himself, our Pasch." "The Eucharist is the efficacious sign and sublime cause of that communion in the divine life and that unity of the People of God by which the Church is kept in being. It is the culmination both of God's action sanctifying the world in Christ and of the worship men offer to Christ and through him to the Father in the Holy Spirit. ".